Looking for the perfect Valentine’s Day dinner? 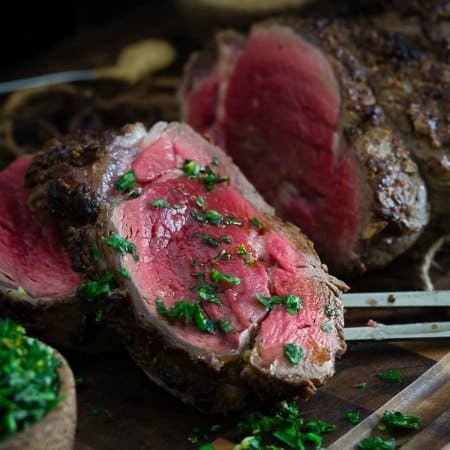 This balsamic dijon beef tenderloin roast is both simple and impressive. Served with a Meyer lemon gremolata, it’s the perfect holiday dish. This beef tenderloin roast took 5 different stores and a heck of a lot of frustration to procure. Apparently, you can buy beef tenderloin in cute little 1 pound or less steaks or, you can buy about 9 pounds of it in roast form (9 pounds x an average of $15.99/lb, you can quickly do that math and figure out why I didn’t give up and just buy the huge roast) but you cannot easily find a 2-3 pound roast for say, a normal 4 serving dinner. I might’ve let out an audible “finally!” in the meat department when I found this. Luckily, it was 8:45pm and the place was about to close so not too many people got to witness the crazy. I can’t even remember the last time we actually did something for it since someone always seems to be working or traveling somewhere. This year will be no different as Ulysses is working and I’ll likely be spending it visiting my brand new niece but it made eating this beautiful balsamic dijon beef tenderloin roast a week early seem ok. If you’re someone who likes steak medium or more well done, this isn’t the recipe for you. 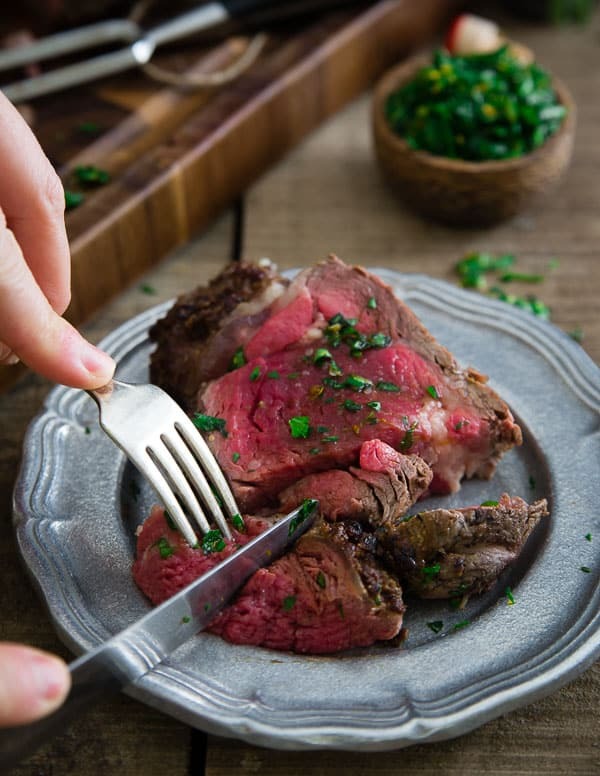 Don’t bother wasting your money (because this meal isn’t necessarily cheap, although cheaper than ordering it at a restaurant for sure) on this cut of meat and go cook a flank steak or something to death instead. THIS is what you need to make for Valentine’s Day. It’s beyond simple (a roast that cooks for less than 30 minutes, say whaaaa??) and there’s literally nothing in the world that goes better with this meal than a glass of dark, chewy red wine. 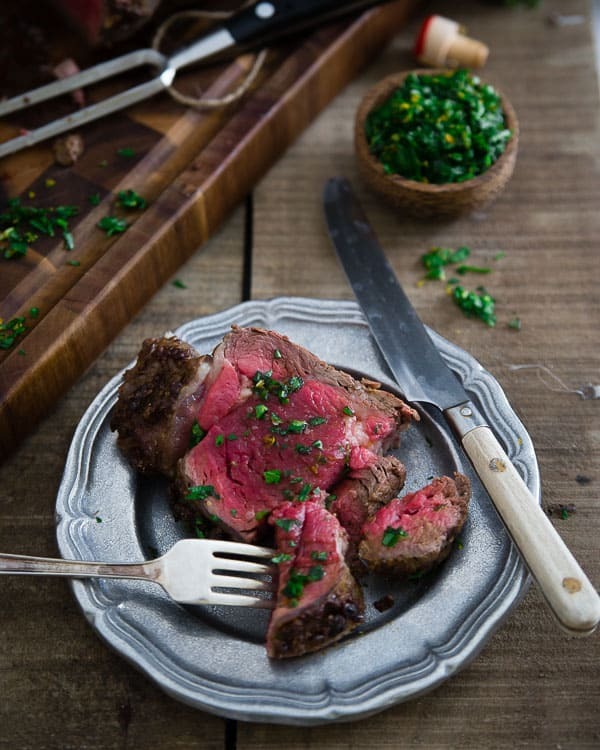 Rare steak + red wine…both aphrodisiacs. The crust is mustardy and sweet from the balsamic (seriously, buy some good stuff for this recipe) and salty while the Meyer lemon gremolata makes every bite pop with freshness. It’s basically like my dream bite of flavors all on one forkful. Looking for other Valentine’s Day dinner ideas? 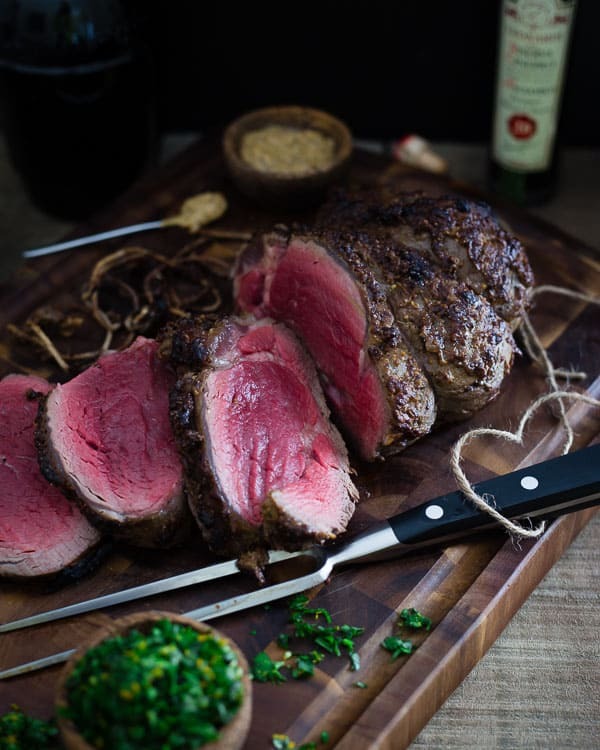 Looking for the perfect Valentine's Day dinner? 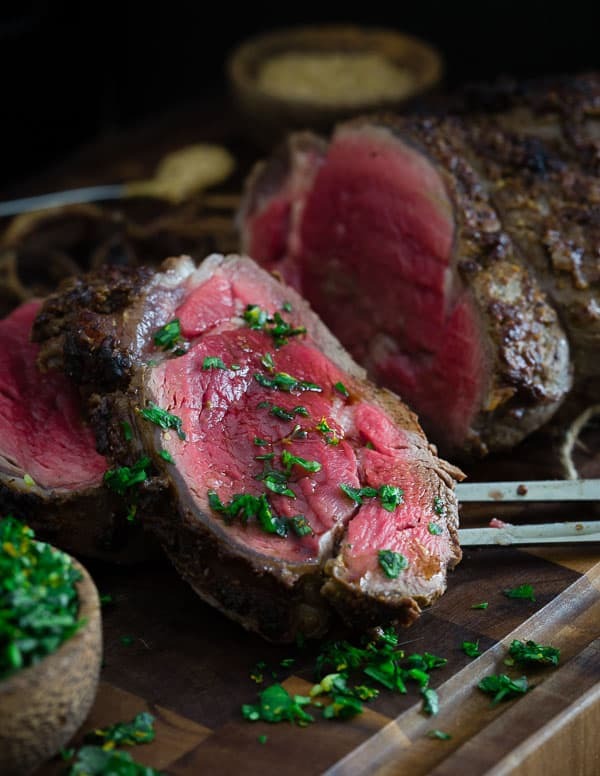 This balsamic dijon crusted beef tenderloin roast is both simple and impressive. Served with a Meyer lemon gremolata, it's the perfect holiday dish. Preheat oven to 500 degrees and line a baking sheet with tin foil. Tie roast in 3-4 places with kitchen string/twine. Place roast on baking sheet and season generously with salt and pepper. Mix mustard and balsamic vinegar in a small bowl and spread all over the top of the roast. Place roast in the oven for 25 minutes for a rare to medium rare steak. Remove from oven, cover with tin foil and let rest for 10-15 minutes before slicing. Combine the parsley, basil, lemon zest and garlic in a small bowl and mix together. I cannot stop staring at these photos. Goodness, the rare center is so beautiful!! I wish I were at your house when you made this…I’d be devouring it with you! Can I say that the meat looks irresistibly good?? I’m not a big meat-eater (call me flexitarian) but when I see such perfection I can’t stop myself! I hope I can make this heavenly good-looking meat myself and not ruin it for me as I often do…Otherwise I’ll keep on admiring your pictures (which is almost as good as I expect it to taste). You seriously make the most beautiful meat! Wowza! I seriously just drooled on my computer. It’s gorgeous. I would take this any day (and everyday!) over going out to eat on Valentine’s Day. And Meyer lemons in the gremolata. YES please! The worst part of being pregnant is not being able to eat rare meat. Some people crave sushi, some wine. I just want a hunk of red meat! This looks perfect. Your photos are stunning and now I must go prepare lunch. Great recipe. Thanks! The things I would DO for this steak. Seriously. This beef is just cooked SO perfectly. I love it!